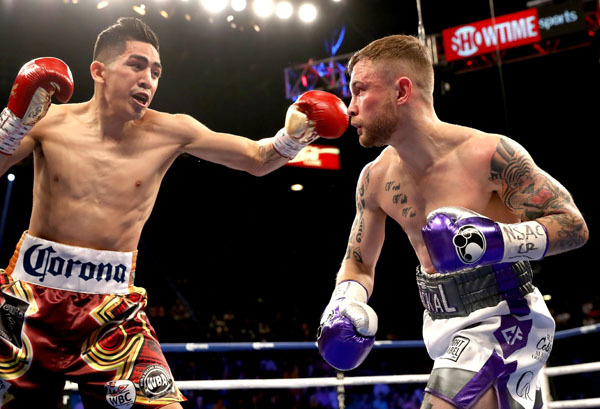 IT was not to be for Carl Frampton at the MGM Grand Garden Arena on Saturday night as ‘The Jackal’ was narrowly edged out by Leo Santa Cruz in their WBA featherweight rematch, writes David Mohan in Las Vegas. The scores read 115-113 on two of the cards with the third judge scoring it a 114-114 draw in a match-up in which it was hard separate the pair, but there were no excuses or complaints from Frampton who was happy to acknowledge he came up just short on the night. It was disappointing for Frampton and his army of fans who helped light up the Vegas Strip at the weekend, but the North Belfast man lost nothing in terms of credibility in defeat and again contributed to an absorbing match-up. “Obviously I’m very disappointed,” he said. Frampton felt he started a little too slow, but there was very little between the pair in most of the rounds with Santa Cruz delivering a patient and disciplined performance, turning away from his usual all-action style to out-box Frampton at stages to nick rounds, but there was little in it with the result certainly in doubt prior to the announcement. Perhaps Frampton was trying to load up a little too much as he chased the power shots he felt could trouble the Mexican, but in doing that he was negating his boxing skills and jab that contributed to his downfall in a way. It was not the all-out war that was their first meeting in the Barclays Centre, but a highly-skilled battle that Frampton admitted saw him being out-boxed by the brawler at times. “Leo is a tremendous fighter and he surprised me with his tactics,” he admitted. “I honestly didn’t believe he could box like he did. He was able to box on the back foot a lot and if I’m honest, hand on heart, I think that Leo deserved the win. A couple of rounds were pretty close and I thought that I was doing okay in some of the rounds, but Leo used his experience and stole them with bursts in the last 15 seconds. I believe he deserved to have his hand raised so congratulations to the new champion and hopefully we can do it again. The outcome means that both have now won one apiece with a third meeting almost inevitable. Whether that happens next or down the line is unclear for now. Santa Cruz did say at the Belfast press conference ahead of the fight that he was happy to box in the city should another rubber be required, and while he said he would be a man of his word, there was also a hint he could be shopping around for his next dance partner. “I’m very happy and I’m glad I got (won) this fight,” said the returning champion. “Carl Frampton is a great fighter and a great man. I respect that. He gave me a hell of a fight. He has everything, great skills and great power, great footwork but this time I came with a great game plan. My dad, my brothers and everyone, we worked hard in the gym. I put it in my mind that if I lost I would maybe retire because you are here to be the best and if he beat me what else am I going to do? Carl Frampton is a great fighter and if they want to make it a trilogy, I’ll talk to my promoter and manager and let’s make it. I’m up for it. I’m a man of my word and if we can come to an agreement, I’m happy to make it a third fight but there are options out there too.